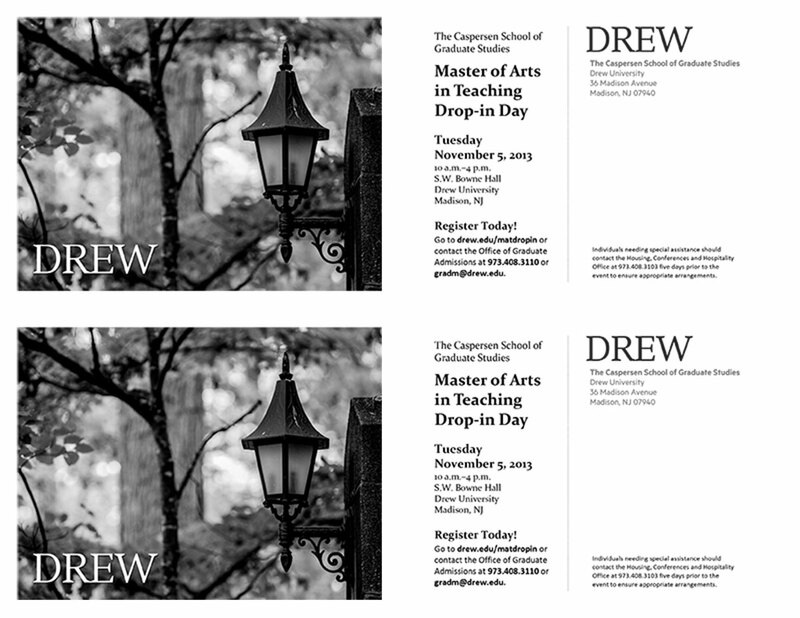 The Drew logo should be on all of your communication materials. You can download several options below. If you need university-approved postcards or powerpoint templates, you may download them here. Examples showing how you might use them are included below. Launch will officially begin in Fall of 2019. Below are communication materials to help you spread the word. This piece introduces Launch to a prospective student audience. • View/download cover + single pages. • View/download cover + spreads. • Read, cut + paste the included student testimonials. Launch syncs career development with rigorous academics and powerful community. You graduated from high school. Drew is the place you come when you are ready to turn your attention to your next big goal: to launch your life. We help you identify or refine a career of purpose and devise a strategy to help you launch. Everyone at Drew–faculty, staff, coaches, peers–is deeply invested in this goal. It’s what we do. If you aren’t serious about this goal, perhaps Drew isn’t the best fit for you right now. Everything you do at Drew is to prepare you to launch and every student automatically participates in the program. From the second you step foot on campus, nearly every activity in which you engage–in the classroom, in New York City, in the lab, on the stage, in the field, etc., is carefully designed to prepare you to launch. We help you create a cohesive, fun, purposeful and relevant educational experience. You’re guided by a customized mentorship team throughout your four years at Drew. Your faculty, alumni, industry and staff mentors share their expertise plus how it applies to your potential graduate degree and/or career. This team of people works with you and behind the scenes to ensure a successful launch. They help you develop an individualized plan for you given your interests, passions and goals. Each student’s team might be different but all include faculty and staff mentors, Drew alumni and industry professionals. Launch guarantees two real-world learning experiences, such as internships, our New York City semesters, hands-on scientific research, etc., that allow you to practice what you learn and demonstrate the kind of experience and skills that impress employers and graduate school admissions teams. A successful launch requires that you learn the skills needed to be successful and that you are able to show and explain those skills to employers and on graduate and professional school applications. Our skills based Launch program ensures you can do both. The program provides opportunities to earn industry-recognized credentials in, for example, WordPress, AdWords, project management, etc. These credentials, typically earned well after someone graduates, pair with your major and polish your resume so that it stands out. You belong to a powerful community of friends for life, first-rate fellow students and a vibrant network of 25,000+ alumni. Feel the power of being connected. Your teammates include your peers, and the relationships you build with them is critical. Connect with them, and the larger Drew community, while engaging in many on and off campus activities. Whether it is attending events, participating the long-standing Drew traditions or hanging out with others on campus, Drew gives you the knowledge, the networks, the support and the opportunities you need to launch. College tuition is too high so we lowered our tuition by 20% in fall 2018. We rolled it back to 2010 so that even more families could have even greater access to the benefits of a Drew education. Our generous scholarships and need-based financial aid lower costs even more. 80% of students received merit or need-based aid in 2018-19. We offered $32 million in institutional grants and scholarships in 2018-19. Drew was ranked among the “Best Bang for the Buck” colleges by Washington Monthly five years in a row. Fiske ranks Drew among the “Best and Most Interesting” colleges and universities. The Wall Street Journal/Times Higher Education College Rankings place Drew in the top 20% of schools in the U.S.
Drew is listed among The Princeton Review’s Best 384 Colleges. The Princeton Review ranks Drew in the top ten for theater and student interaction. Our campus, called The Forest, is 186 beautiful, wooded acres and includes historic buildings, old-growth trees and an arboretum. There are 90+ student clubs. 25% of students are Ranger student-athletes and there are six club sports. 90% of first-year students live on campus and housing is guaranteed all four years. Community traditions include Move-In Day, Halloweekend, 99 Nights, FernFest, the First Annual Picnic and many more. It’s a ten-minute walk to the train station, and the train takes you directly to Midtown Manhattan in under an hour. Madison, NJ is one of the safest cities in the US. It and nearby Morristown are home to cafes, boutiques and a music scene. In a one-hour radius are a wildlife refuge, the Jersey Shore, the Meadowlands (where the NY Giants, NY Jets and NJ Devils play) and the world-class museums, restaurants, concert venues, sports arenas, clubs, galleries, theaters, architecture, etc., of New York City. All of the images you will find here—whether photos, infographics, icons or wordmarks—have been used in Launch communications and can be used in your materials. See and download on Google Drive. Use this template for your CLA or Launch-related presentations.